The Buyers are Back in Myrtle Beach! Do you already own beach property? Let us show you how our expert sales team can sell your condo or home! As the foremost name in beach and golf vacations on the Grand Strand, attracting buyers from our rental division is both unique and beneficial to sellers. Our large client base receives Condo-World brochures, emails and other traditional marketing pieces that inform them of the great buying opportunities in our area. Our brochures have a section dedicated to the promotion of our sales department and featured properties. Our location just a block off Ocean Boulevard in Crescent Beach is a high traffic area and assures easy accessibility for vacationers, buyers and walk-ins. Condo-World helps you determine the best selling price with a FREE comparative market analysis. We offer professional advice on preparing your property for sale and understanding your contract. We keep you updated on your listing activity and informed of current market activity. We will present all buyer offer contracts to you immediately and negotiate the best contract price for you. Once you have accepted an offer, our sales office will help you contact an attorney, and we will handle sending all paperwork, make contact calls, and inform you of the progress throughout the selling process. 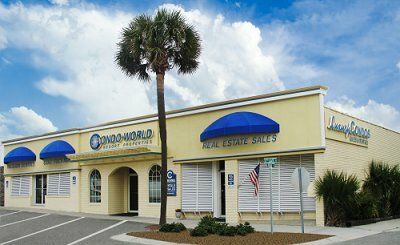 When you enlist the services of the Condo-World Sales Division, you are receiving a commitment to fast, professional and knowledgeable service. Our agents specialize in the North Myrtle Beach and Myrtle Beach condo and vacation property market, and we know how to get your listing in front of the right buyers.